Born from innovation – driven by technology. The perimeter and slab of the foundation accounts for up to half of a building’s heat loss. This is why below-grade insulation is such a critical component of an energy-efficient building envelope. 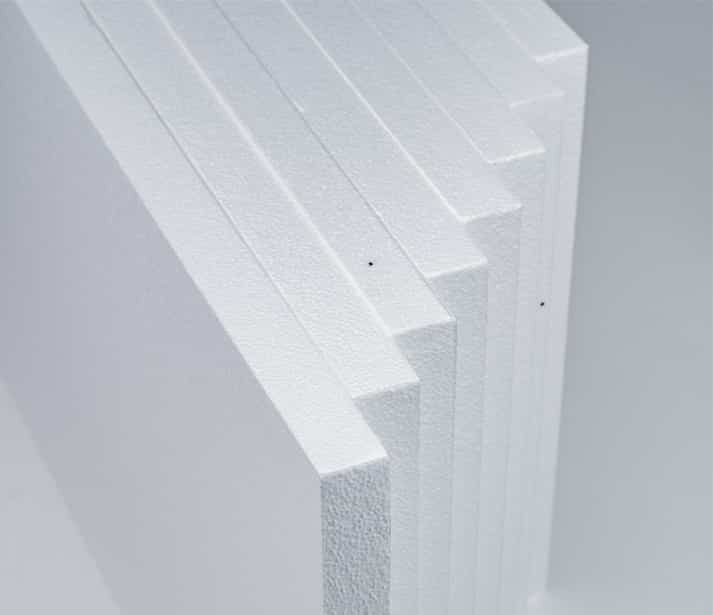 Expanded polystyrene (EPS) provides a cost-effective insulation that enhances the efficiency of both heating and cooling systems. Expanded polystyrene is known for its ability to resist and quickly release moisture. This ability ensures that EPS maintains its R-value over time. As a result, EPS has gained wide acceptance in perimeter, below grade, and floor insulation applications. SuperForm EPS+ is a high-grade expanded polystyrene (EPS) rigid foam insulation. It provides a dependable insulation product that can be used for almost every type of building insulation application. Its stable R-value and high compressive strength coupled with its ability to resist and quickly release moisture makes EPS+ ideal for perimeter, below grade, and floor insulation. Stable – R-Value: Provides a stable R-value that does not deteriorate over time. Compressive Strength: Available in 10, 16, 20, 25, and 40 psi. Moisture Resistance: Closed cell polystyrene insulation that is proven to resist moisture gain. Vapor Permeable: Vapor permeability that ranges from 2.5 – 5.0 ng/Pa·s·m2 per inch thick. Drying Potential: Designed to quickly release moisture and maintain its R-value over time. SuperForm MAX+ is a premium Neopor® graphite polystyrene (GPS) rigid foam insulation. MAX+ features all of the performance attributes of EPS+, complimented by the added benefits of its unique graphite cell structure. MAX+ uses high-purity, graphite particles to create a reflective cell structure. This distinct cell structure reflects radiant heat as it travels through the insulation. As a result, MAX+ delivers one of the most efficient perimeter, below grade, and floor insulation products available. Stable R-Value: Provides a stable R-value that does not deteriorate over time. A high-performance building envelope requires durable, energy-efficient insulation that maintains its R-value over time. Expanded polystyrene’s physical and mechanical properties provide a cost-effective insulation with a stable R-value. This means that buildings that insulate walls and ceilings with EPS experience greater energy-efficiency and lower energy costs. All building frame types require a thermal barrier. EPS siding underlayment and sheathing creates a thermal barrier with a stable R-value that does not deteriorate. This barrier helps reduce thermal bridging, air infiltration, and energy flow through the walls. 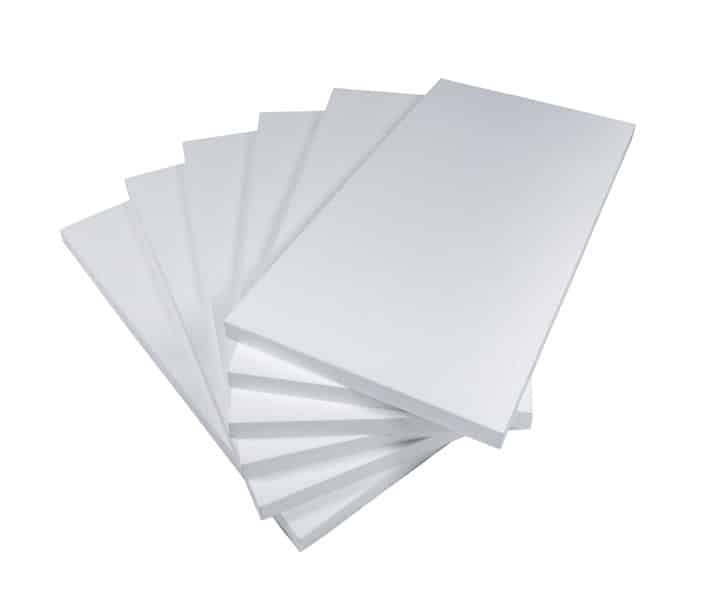 Additionally, EPS foam boards provide a smooth flat surface for siding. Superform EPS+ is a high-grade expanded polystyrene (EPS) rigid foam insulation. It provides a dependable insulation product that can be used for almost every type of building insulation application. A stable R-value and compressive strength provide an inexpensive, energy-efficient insulation solution available in a wide range of thicknesses. Additionally, EPS+ meets CAN/ ULC S701 and ASTM C578 Standard Specification for Rigid, Cellular Polystyrene Thermal Insulation. EPS+ is manufactured from expanded polystyrene resin using a pentane blowing agent. This process does not use the hydrofluorocarbons (HFCs) typically used to produce XPS. The result is a closed, air-filled cell structure that does not contain HFCs with a very low impact on the environment. Vapor Permeable: Allows moisture vapor to effectively move through its structure. Low Environmental Impact: Does not use or contain ozone-depleting blowing agents such as HFCs. Manufactured from expanded polystyrene resin using a pentane blowing agent. This creates an air-filled, closed cell foam. Manufactured using polystyrene, blowing agents, and dyes. This creates a closed cell foam that often contains hydrofluorocarbons (HFCs). Provides a stable R-value that does not deteriorate over time. Less stable and the R-value deteriorates as gasses escape its cells. Available in 10, 16, 20, 25, 40 psi. Typically only available in 15, 25, and 40 psi. Impressive cost per R-value and compressive strength. As a result, EPS+ is a dependable, cost-efficient insulation solution. A much higher cost per R-value than EPS+. Additionally, its R-value is less stable and deteriorates over time. Designed to quickly release moisture. This enables it to dry quickly and maintain its R-value over time. Often traps moisture due to its low drying potential. Its inability to release moisture causes its R-value to deteriorate over time. Closed cell polystyrene insulation that is resistant to moisture gain. EPS products have been proven to resist moisture in both short (24hour) and long-term tests. Closed cell polystyrene insulation that is resistant to moisture gain. However, its ability to resist moisture has only been proven in short-term (24 hour) tests. Vapor permeability that ranges from 2.5 – 5.0 ng/Pa·s·m2 per inch thick. Typically has a vapor permeability of 1.5 ng/Pa·s·m2 per inch thick. Low impact on the environment. Its manufacturing process uses a pentane blowing agent instead of the hydrofluorocarbons (HFCs) blowing agents typically used to produce XPS. High impact on the environment. Its use of hydrofluorocarbons (HFCs) as a blowing agent cause a very high global warming potential (GWP). It also uses harmful color dyes not found in EPS+. Meets CAN/ ULC S701 and ASTM C578 Standard Specification for Rigid, Cellular Polystyrene Thermal Insulation. Superform MAX+ is a premium Neopor® graphite polystyrene (GPS) rigid foam insulation. MAX+ features all of the performance attributes of EPS+, complimented by the added benefits of a unique graphite cell structure. Superform MAX+ delivers one of the most efficient, cost effective, and sustainable insulation products available. Additionally, MAX+ meets CAN/ ULC S701 and ASTM C578 Standard Specification for Rigid, Cellular Polystyrene Thermal Insulation. Superform MAX+ uses high-purity, graphite particles to create a reflective cell structure. This distinct cell structure reflects radiant heat as it travels through the insulation. Get maximum energy efficiency, stability and durability, and moisture management with MAX+. Compressive Strength: Available in 10, 16, 20, and 25 psi. 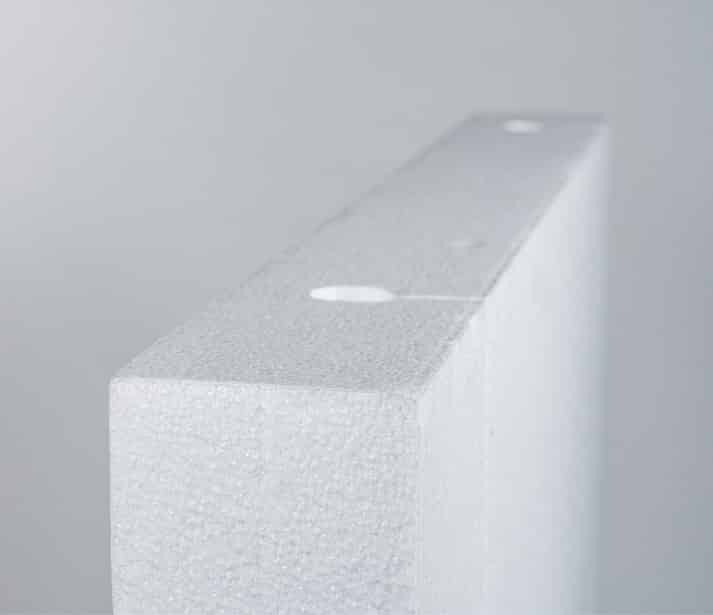 Moisture Resistance: Closed cell polystyrene insulation proven to resist moisture gain. Drying Potential: Designed to quickly release moisture and maintain its R-value. Manufactured from graphite expanded polystyrene resin using a pentane blowing agent. This creates an air-filled, closed cell foam. Available in 10, 16, 20, and 25 psi. Impressive cost per R-value and compressive strength. As a result, MAX+ is a dependable, cost-efficient insulation solution that on average costs 10 - 30 percent less than XPS. A much higher cost per R-value and on average costs 10 - 30 percent more than MAX+. Additionally, its R-value is less stable and deteriorates over time. High impact on the environment. Its use of hydrofluorocarbons (HFCs) as a blowing agent cause a very high global warming potential (GWP). It also uses harmful color dyes not found in MAX+. Meets CAN/ ULC S701 and ASTM C578 Standard Specification for Rigid, Cellular Polystyrene Thermal Insulation..
SuperForm EPS+ provides an inexpensive, energy-efficient flat roof insulation known for its stable R-value, moisture resistance, and high compressive strength. This lightweight, unfaced expanded polystyrene insulation is perfect for built-up, single ply, and modified bitumen roof systems. Architects and builders consistently select EPS+ based on its reputation as a high-quality roofing system insulation. Direct-to-Deck: Satisfies the requirements for direct-to-deck. Low Environmental Impact: Recyclable and does not use or contain CFCs, HFCs, HCFCs or formaldehyde. • XPS and Polyiso use blowing agents that will lose R value over time. • Polyiso loses R value during cold and extreme high-temperature exposure. SuperForm EPS+ sloped roof insulation is designed to provide energy-efficient, moisture resistant insulation with a positive slope-to-drain design. EPS+ is manufactured using pentane as a blowing agent. This ensures that its high R-value remains unchanged over time, even in extreme temperatures. As a closed cell polystyrene insulation, EPS+ is proven to resist moisture gain and quickly dry. When coupled with a low slope roof design, it eliminates areas for water to collect or pool. EPS+ complies with requirements for most fire-resistant roof assemblies. Slope-to-Drain: Readily available in slopes of 0.5 %, 1%, 1.5%, 2%, 3%, 4%, and 8% per foot. Low Environmental Impact: Recyclable and does not use or contain ozone-depleting blowing agents such as HCFCs. SuperForm EPS+ is a lightweight, expanded polystyrene insulation perfect for use in modified bitumen roof systems. Modified bitumen membranes offer a weather resistant, energy efficient, flexible roofing solution that is easy to maintain and repair. EPS+ compliments these systems by providing an insulation with a stable R-value and high compressive strength that is moisture resistant and can withstand extreme weather conditions. Modified bitumen membranes are typically applied by torch or using hot asphalt. Both of these methods can damage the EPS+ panel if it is not properly protected. As a result, it is important to always include a protective board on top of the EPS+ panel when applying by torch or using hot asphalt. EPS+ complies with requirements for most fire-resistant roof assemblies. SuperForm EIFS+ is an expanded polystyrene insulation board designed to optimize the performance of exterior insulation finish systems (EIFS). It is ideal for both residential and commercial projects as it is lightweight, energy-efficient, and delivers endless design options. EIFS+ provides a breathable thermal layer that is easily affixed to the substrate with an adhesive or mechanical fastener. Its closed, air-filled cell structure is designed to resist and quickly release moisture. This helps ensure that your EIFS retains its R-value over time. Low Cost per R-Value: Provides a low cost per R-value insulation layer that does not deteriorate. Design Flexibility & Aesthetics: Delivers endless design options that can be easily modified at the jobsite. Moisture Management: Designed to resist and quickly release moisture to help maintain its R-value over time. Surface Bonding: Offers exceptional surface bonding for base coats. Lightweight and Durable Lightweight and built to provide long term performance and durability. Low Environmental Impact Does not use or contain ozone-depleting blowing agents such as HFCs and is recyclable. Termite Resistant Deters termites using a unique termite resistant additive. SuperForm Products Ltd. retains the services of the Quality Auditing Institute (QAI) for third-party quality assurance testing and certification. SuperForm Hydro Panels are designed for hydronic heating applications. These insulation panels provide a thermal barrier and channels for cross-linked polyethylene (PEX) tubing. Their distinct PEX tube locking design eliminates the need to tie or staple the tubing to a wire mesh. This directly results in cost savings as installation times are shorter and hardware such as staples, ties, and wire mesh are not required. 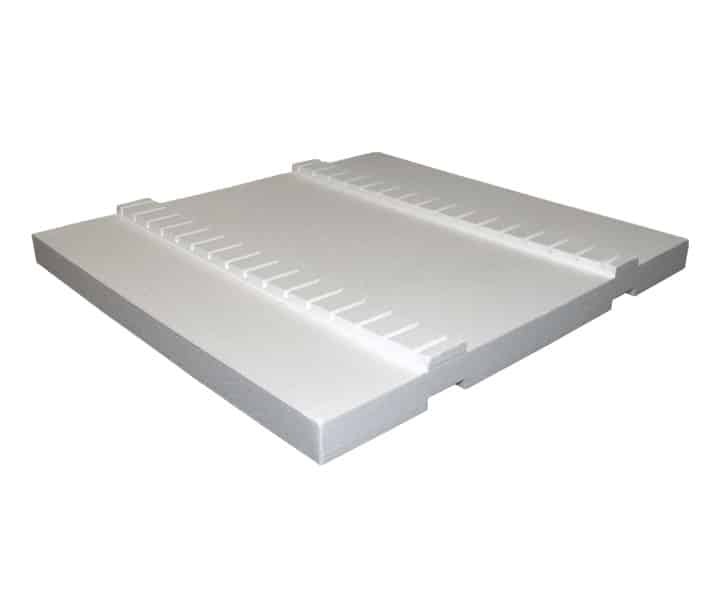 Hydro Panels are made of a durable expanded polystyrene insulation that provides a moisture resistant, thermal barrier between the ground and concrete slab. Additionally, their channel pattern ensures that heat is consistently transferred between the tubing and concrete. As a result, desired room temperatures are achieved quickly. Quick to Install: Distinct locking design eliminates the need to tie or staple PEX tubing to a wire mesh. Consistent Heat Distribution: Consistent channel pattern ensures even heat distribution. Lightweight and Durable: Lightweight and built to provide long term performance and durability. Reduce and Recycle: Size helps reduce waste on site and scraps can be recycled. Superform MAX+ is a rigid foam insulation that is your answer for structural insulated panels (SIPs). Structural insulated panels often consist of an expanded polystyrene (EPS) foam core that is laminated between two sheets of oriented strand board (OSB). These panels are typically used for wall and roof applications due to their high energy-efficiency and superior structural properties. SIPS can be produced in large panels up to twice the size of standard panels. These larger panels reduce installation time and require fewer connectors. By reducing the number of connectors and using a MAX+ core, SIPs can greatly reduce thermal bridging, air infiltration and energy flow through a building’s walls and roof. Effective structural insulated wall panels are energy-efficient and reduce thermal bridges. MAX+ is a premium expanded polystyrene insulation with a closed, air-filled cell structure. This helps resist and quickly release moisture which ensures that MAX+ insulated SIPs maintain their R-value over time. Structural insulated panels are perfect for any type of roof. They provide design flexibility and like SIP walls can be produced in any thickness. Structural insulated roof panels can considerably reduce installation times as they are pre-fabricated. They also provide superior load strength and can be covered in any standard roof sheathing. MAX+ is a cost-effective way to insulate everything from flat or low slope commercial roofs to vaulted ceilings. Superform MAX+ is a premium Neopor® graphite polystyrene (GPS) rigid foam insulation. MAX+ features all of the performance attributes of EPS+, complimented by the added benefits of its unique graphite cell structure. This enables Superform MAX+ to deliver one of the most efficient, cost effective and sustainable insulation products available. MAX+ meets CAN/ ULC S701 and ASTM C578 Standard Specification for Rigid, Cellular Polystyrene Thermal Insulation. Superform MAX+ uses high-purity, graphite particles to create a reflective cell structure. This distinct cell structure reflects radiant heat as it travels through the insulation. As a result, MAX+ provides maximum energy efficiency, stability and durability, and moisture management. Compressive Strength: Available in 10 and 16 psi. SuperForm MAX+ is a durable insulation that is ideal for precast concrete wall and floor panels. MAX+ is a lightweight and cost-effective insulation solution that provides optimal energy-efficiency. Additionally, it is designed to resist and quickly release moisture which helps maintain the R-value of precast concrete panels. Unlike extruded polystyrene (XPS), MAX+ provides a stable R-value that does not deteriorate over time. This is because MAX+ does not use or contain ozone-depleting blowing agents that are known to gradually dissipate. As a result, MAX+ delivers an impressive R-value that on average costs 10 – 30 percent less than XPS. Insulated precast concrete wall panels are composed of two layers of concrete separated by a continuous layer of insulation. MAX+ delivers a premium insulation layer that can withstand the stress of extreme freeze-thaw cycles. Additionally, integrating MAX+ into the design of precast concrete panels helps transmit gravity, wind, and seismic loads. MAX+ insulation is fully enclosed in precast concrete slabs manufactured offsite in a covered environment. These precast insulated concrete floor slabs are fireproof and allow for quick, easy installation at the job site. Since they are form finished on each side, the floor panels offer a smooth surface that does not require any additional finishing. 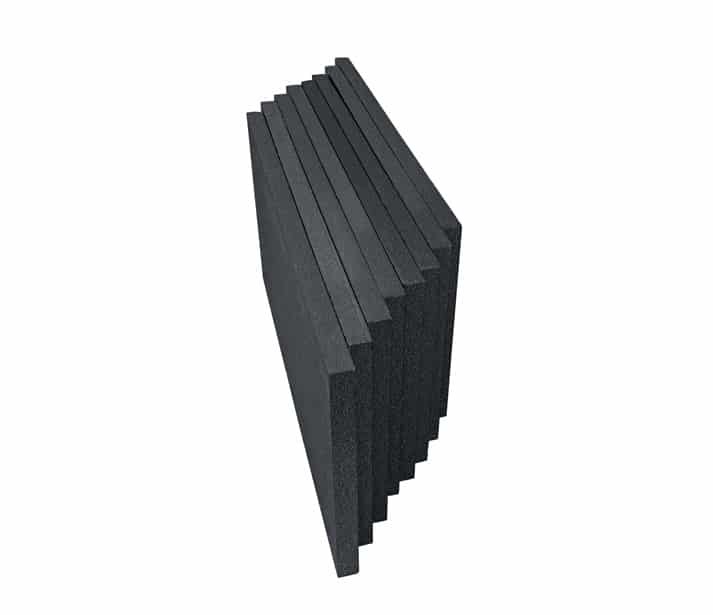 SuperForm EPS+ Floatation Blocks are made from expanded polystyrene. These highly buoyant blocks can be shaped and sized to fit the needs of any floatation application. 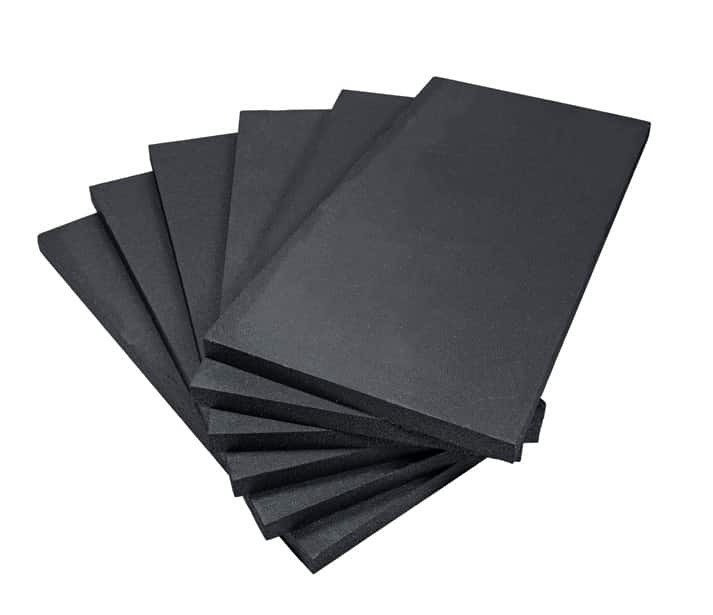 EPS+ Floatation Blocks with durable coatings have improved lifespan by providing puncture protection and reducing ultraviolet (UV) degradation. High Buoyant Density: Delivers a high buoyant density that can support up to 55 lbs./ft3. Design Flexibility: Offered in countless shapes and sizes for any floatation application. Extremely Durable: Extremely durable and remains buoyant even when damaged or punctured. Low Environmental Impact: Contains no CFCs, HCFCs, HFCs, or formaldehyde and is resistant to UV degradation.